It’s that time of year again when we pull out the tattered address book, its many scraps of paper with jotted down addresses falling out like confetti. They never seem to get permanently written on the pages of the book that was designed for them. Either that or there are several addresses for one person, some scratched out some not. Which one is the correct one? People don’t seem to stay in one place anymore. Of course we are guilty of that as well so I can’t say anything. My mother has had the same address book since 1979 and she can tell you every address Sonny and I have had since then. Her book has so many scratched out addresses for us it looks like a hit list. Most people keep their addresses in their iPad or phone or some other electronic gadget. Stamps have gotten so expensive that I think most people will just email or text a Merry Christmas Greeting, but I think there is something special about getting a card in the mail with a personal note or signature. Especially at Christmas. There is always an excitement when going to the mailbox to see if a card might be hiding between the pages of junk mail. What fun it is to open the envelope and admire the many Christmas scenes on the front of the card. They can be glittery or plain, it doesn’t matter. They are all beautiful. There may be pictures of loved ones tucked inside, or a note from someone you haven’t heard from in a while. Of course as a kid you always hoped it contained money. We have had a light snow falling all day. It may be cold outside but its warm inside where Christmas tunes fill the house. Moby and Ruby are curled up together in front of the wood stove happily lost in dreamland. It’s a perfect time to fill out my Christmas cards. Its not a chore but a joy. Warm house, music and a cup of hot chocolate are the perfect accompaniments. Soon the envelopes will all be addressed (hopefully with the correct one) and ready to be delivered to family and friends. Hopefully it will bring a smile when they see it in the mailbox and feel special because they were thought of. Sometimes you don’t even have to send it through the mail. You can hand deliver it if you live close by and have a visit too. We have a dozen different ways to communicate today and they serve their purpose in daily life. 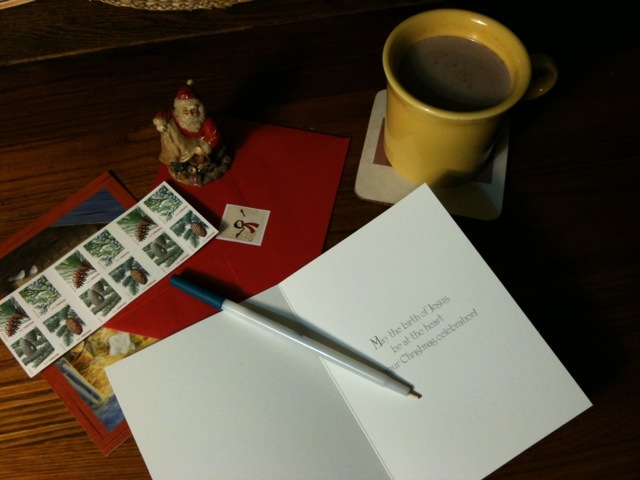 Christmas is a special time and hand written cards seem warmer and more personal. You may not realize how something as simple as a card in the mail can lighten someones day just because you thought of them. So put away the gadgets for a little while. Get into the spirit with some music (without earphones), pour a cup of hot chocolate, and sign your name on a card with a pen. Let’s become human again. Remember, no one can admire emails and text messages sitting on a mantel, or put them away in a keepsake box. Well, technically you can if you print them out, but they certainly aren’t as pretty. Here’s hoping YOUR mailbox is stuffed with Christmas cards! This entry was posted on Sunday, December 5th, 2010 at 11:35 pm and is filed under Off-Grid. You can follow any responses to this entry through the RSS 2.0 feed. You can leave a response, or trackback from your own site. Merry Christmas to you too. It’s like getting a gift In the mail. Remember when we were kids? Everyone sent cards. Mom would have them hanging all around the door and the mantle. Your card will be sent today! I’m torn between both. I use to only want cards but now I can accept a personal email from a friend and not feel offended. I still like a card from close family though. Emails don’t offend me. I’ll take them of course and be glad to get them. Cards at Christmas are just extra special.